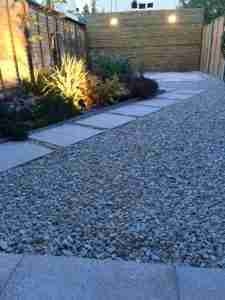 This is a terraced garden we redesigned for our client in Mornington, co. Meath. 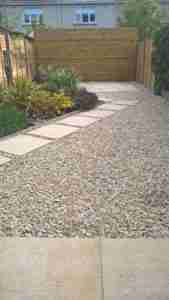 She wanted a more stylish and contemporary garden design that would suit her tastes and needs. Her sitting room overlooked the garden with rear ceiling to floor glass fronted doors and windows which lets in a lot of light in and offers the potential of a great view all year round out to the garden and is the main view from her sitting room & home. 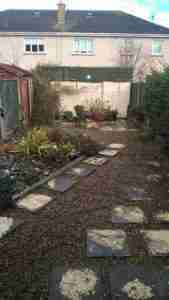 The brief was to have a garden that would look good all year round, be low maintenance but would become a continuation of her home rather than being just a room outside. 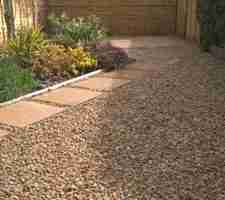 By changing the patio and existing gravel to a warmer coloured material it would naturally offer a brighter garden and allow the reflection of light inside her home. 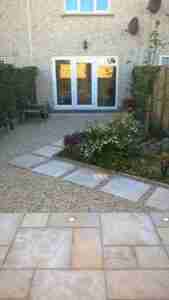 We chose gold granite slabs for the patio and stepping-stones which are a very durable paving and offer the garden a contemporary feel. 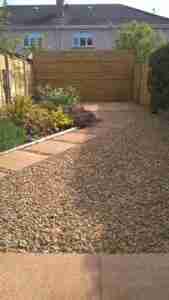 Timber cladding on the back wall makes the existing block wall and creates a dramatic backdrop to the garden. We installed brick lighting in the cladding and Leds in the patio with up lighting spots in the beds to bring another dimension to the garden at dusk and into the night silhouetting the architecturally structured plants. The results speak for themselves.